  ADV Videos  Now This is How You Crash Test New ADV Gear!  The story behind the epic crash in Raiden's new UX ADV gear launch video. 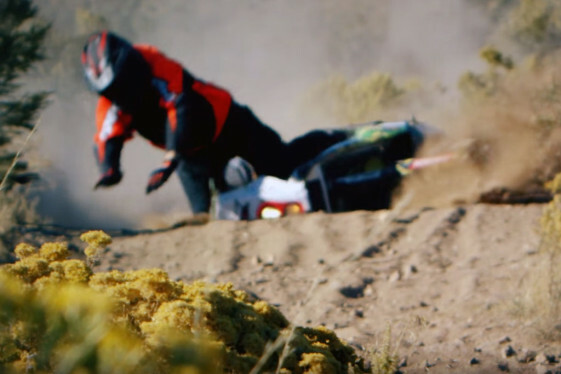 ICON Raiden is known for producing some pretty spectacular adventure riding videos that include a lot of crash scenes, but we have to admit their latest video featured the nastiest fall we’ve seen yet in their extensive library of films. 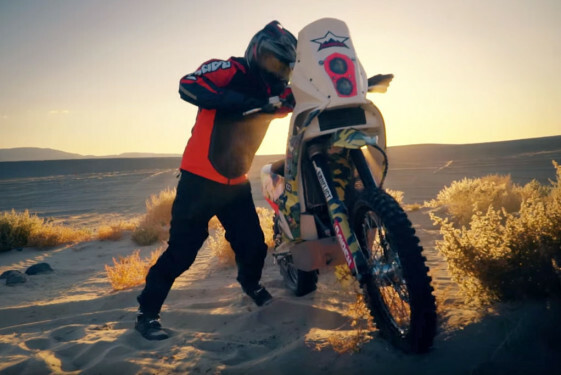 In this promo video, Team Raiden heads out to the desert to do some testing of their new UX ADV Gear line while riding a KTM 450 Rally Bike. The test rider for this video shoot was none other than Dakar Rally Racer Scott Bright. The video showcases some amazing footage of Scott flogging the KTM 450 RR in the dunes and the new UX ADV Gear looks pretty sweet. But when the film gets to a section of big whoops (minute 1:27), things turn nasty. Scott’s rear wheel kicks out to the left and then violently back to the right, before the bike gets completely out of control. The slow motion footage shows Scott stick his arms out to help absorb some of the punishment, and he takes a wallop to the head before rolling to a stop. Seeing the crash at full speed reveals how brutal it really was. If you think you can resist your body’s quick-reflex instinct to stick your arms out in a big fall, think again. No big deal for a Dakar Rally Racer though. They take spills like these all the time… And Scott fell in sand, so that absorbed all the impact, right? Unfortunately, the crash was as bad as it looked. And no this was not an intentional fall to test Raiden’s new ADV Gear. Having heard the story firsthand from Scott, he doesn’t know exactly what caused the loss of control. It was a freak accident that can happen to the best of us, even a world-class off-road racer like Scott Bright. How did he get up, dust himself off and get back on the bike after such a tremendous fall? Well, that’s where the movie magic of this film begins (notice how clean the rider’s gear is at minute 1:51?). Unfortunately, Scott Bright wasn’t able to get up unscathed from his fall like it showed in the film. Assuming they are trying to keep him from making his injuries worse, he sits still. A few seconds later the hissing noise seems to dissipate and that’s when he learns he almost gets struck by a pissed off rattle snake just a few feet from him. Luckily, the snake decided to slither away instead of making Scott’s bad day much much worse. But that wasn’t the end of Scott’s bad luck. If you’ve ever taken a tumble like this one, then you probably already know Scott didn’t get up and ride off into the sunset like it shows in the film. The result of his crash was a trip to the hospital where he received the news of ‘two’ broken arms. 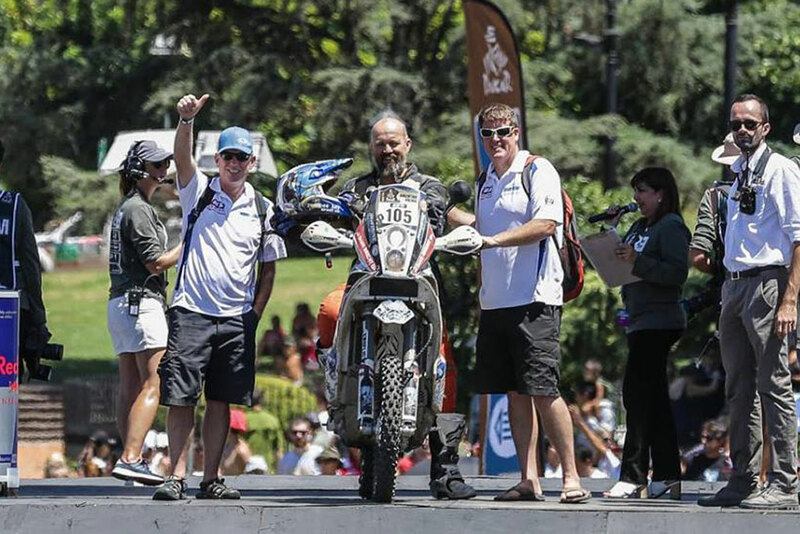 This occurred just a few months before his Dakar Rally debut – A dream he’d been working so hard to make a reality for years. After two surgeries and lots of painful rehab, Scott was thankfully able to make it to South America where he endured 13 days of grueling stages to place an impressive 53rd! While Raiden probably never wanted to launch their new UX ADV Gear line with an injury, no gear is going to protect extended arms from being crushed in a high-speed fall like this one. All we can say is Scott is one tough dude. Not even rattle snakes want to mess with him! Honda NX650 Dominator Coming Back for 2017? What a tough dude. Hats off Scott! Handlebar caught him square in the nutz!!!! A good example that you should put some emphasize on safety, not speed when you are (alone or not) far outside in the wilderness. The next hospital might be hours away! But many times I get the impression that folks forget about that! Same over there as here in Sweden.